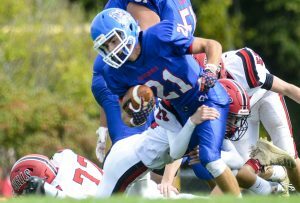 Defending Class D state champ Warriors rushes for 360 yards in rout. 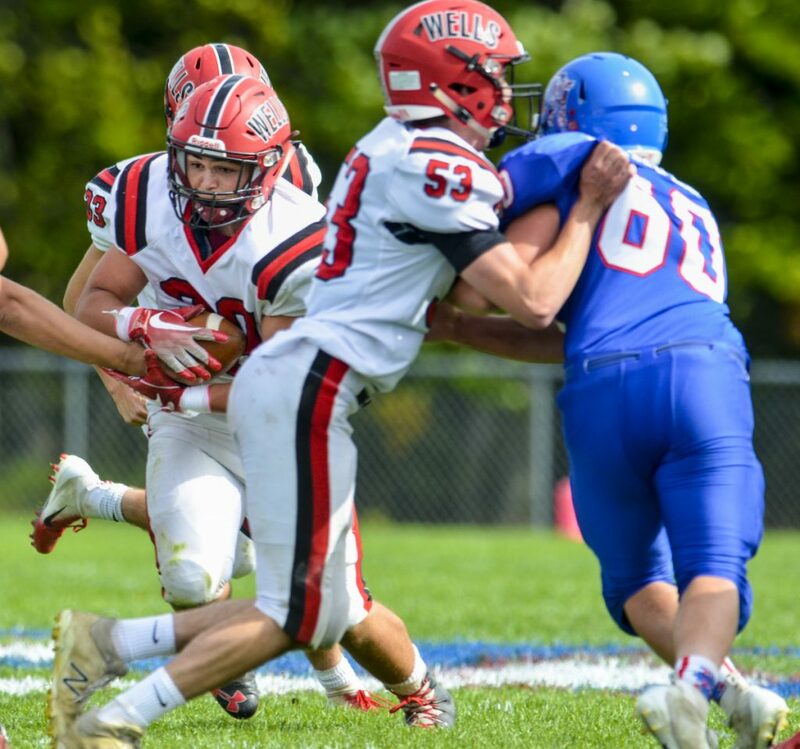 WALES — What began as a close game Saturday at Oak Hill turned into a rout, thanks in large part to Wells senior Tyler Bridge. 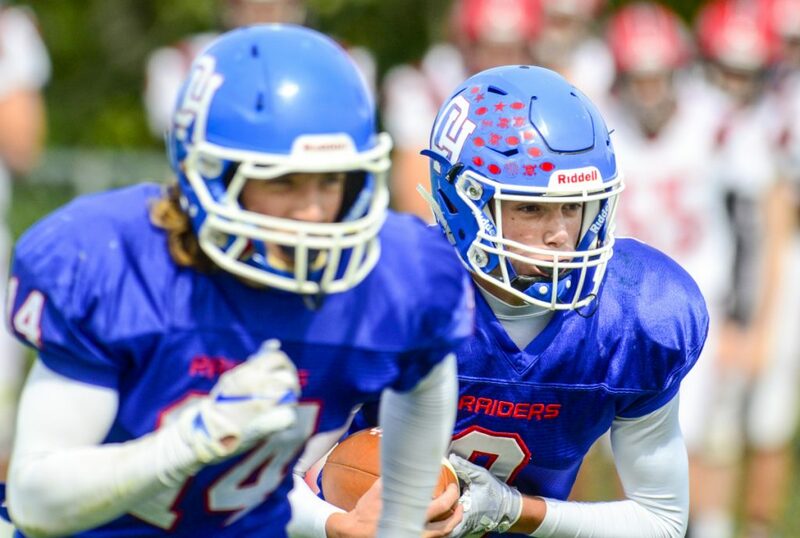 A heavy underdog against the two-time defending state champion Warriors, the Raiders found themselves in a second-quarter tie and the home crowd behind them. 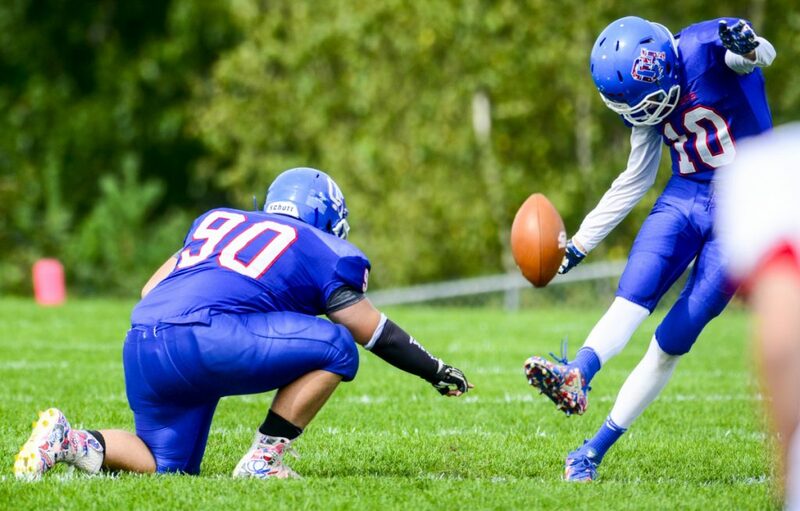 But a couple of miscues in their kicking game turned the momentum toward the Warriors, who never let go. 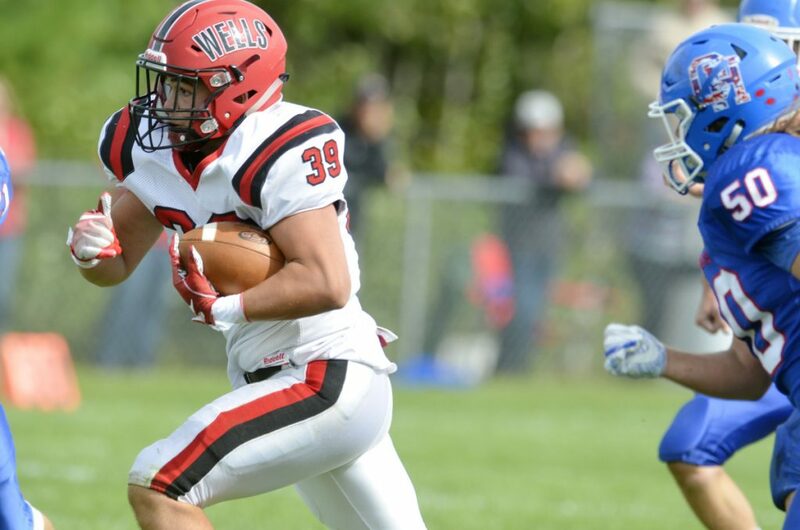 Bridge threw an option pass for a touchdown and rushed for three more scores to lead Wells to a 56-13 victory in a Class D South contest. The Warriors improved to 4-0 while Oak Hills fell to 2-2. 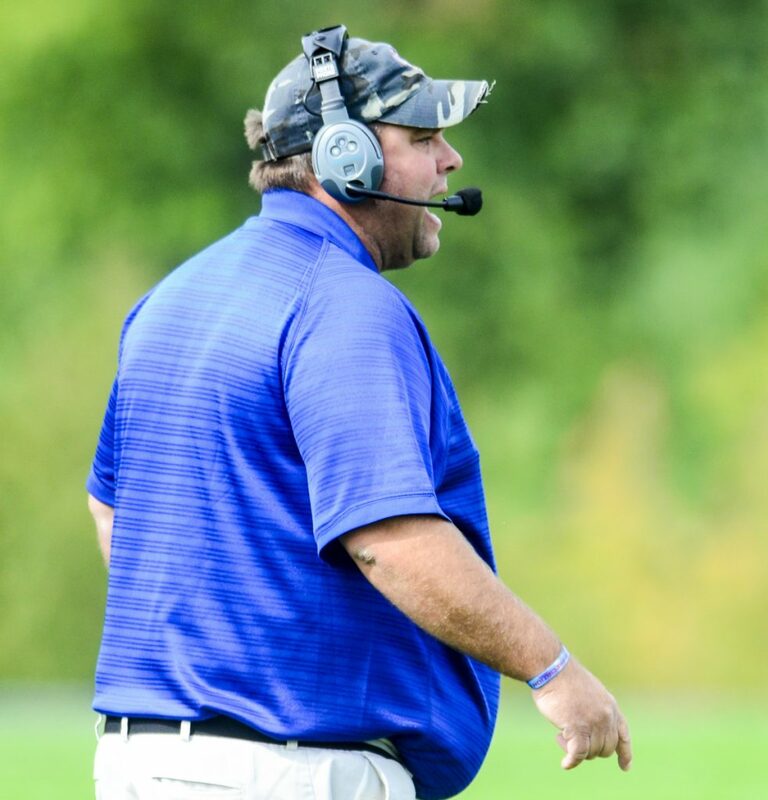 Oak Hill coach Stacen Doucette surveys the action against Wells during a Class D South game Saturday in Wales. Wells won the Class C title two years ago before dropping to Class D last year, where it dominated the competition. 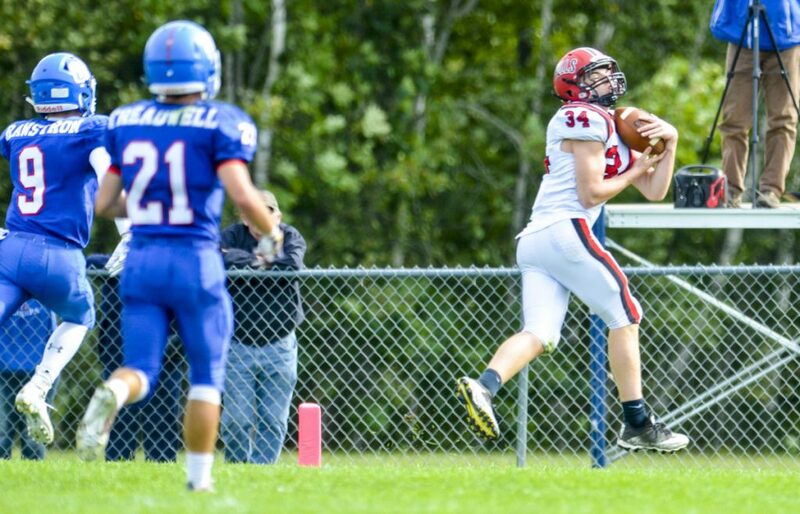 With the graduation of all-conference running back Nolan Potter, opponents hoped the Warriors might take a step back this season, but Bridge has taken over where Potter left off. Bridge looked pretty beastly himself Saturday, rushing for 113 yards on 11 carries. He also rushed for two conversions, returned punts, played safety and held for extra points. Wells rushed for 360 yards on 35 carries and enjoyed several standout performances. Payton Mackay scored on a 54-yard sweep and caught a 28-yard option pass from Bridge in the second quarter. “We just put that play in this week,” Bridge said. The Raiders had their moments early on. They drove 65 yards, all on the ground, on the game’s opening drive with sophomore quarterback Gavin Rawstron sneaking in from the 1. 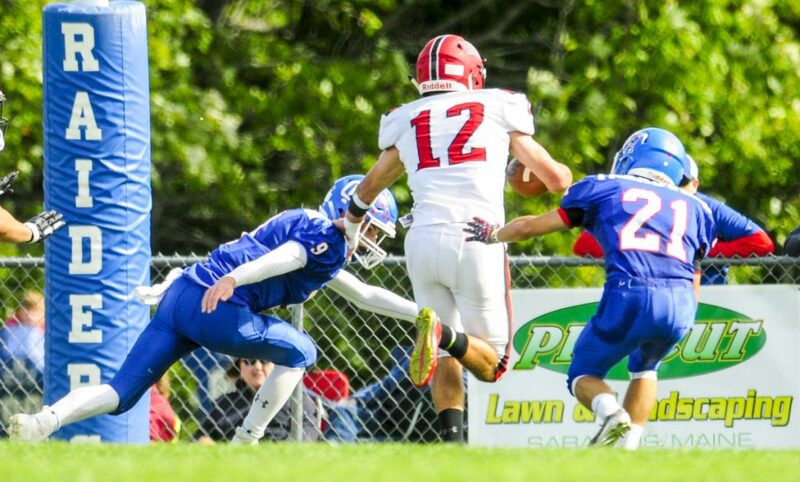 Wells responded with two scores, the first a 7-yard run from Matt Tufts, with the second the option pass from Bridge. Oak Hill running back Caleb Treadwell tries to fight through a tackle during a Class D South game Saturday in Wales. The Raiders came back after the touchdown pass — the only pass for Wells all day — with a passing series of its own. Rawstron completed 4 of 5 passes on the ensuing drive, highlighted by a gain of 21 yards to Sam Lindsay and a quick screen to Caleb Treadwell that went for 13. The young QB capped the drive with another 1-yard scoring plunge that tied the game at 13 early in the second period. But the momentum would soon fade. A bad snap on a punt and a short punt on the next Oak Hill drives gave the Warriors short fields and they capitalized both times, with the 6-foot-3, 200-pound Bridge scoring on runs of 2 and 39 yards to make it 28-13 at the half. Bridge, Mackay and Matt Sherburne scored on runs of 12 yards, 54 and 22 in the third quarter to out the game out of reach. Rawstron finished 6 of 10 in the first half but lost his top receiver, Treadwell, to injury and didn’t complete a second-half pass. He also led the Raiders in rushing with 77 yards on 17 carries. Jonah Potter finished with 52 rushing yards for Wells while Tufts rushed for 49.